Provides novel soundtrack to Jan Hurtado effort. 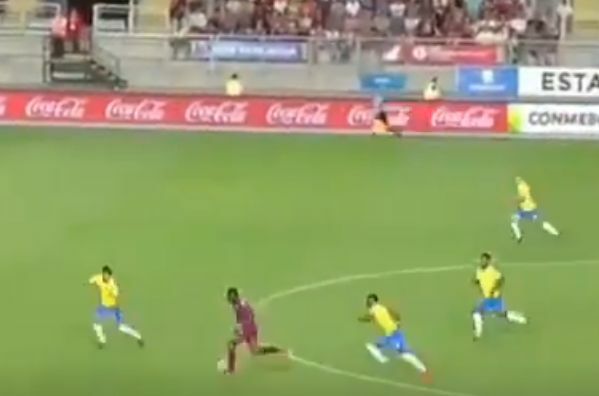 A commentator mimicked Formula 1 car engine noises as Venezuela Under-20 forward Jan Hurtado hurtled towards goal during a 2-0 win over Brazil. Hurtado, who plays for Argentine Primera División side Gimnasia y Esgrima, scored both goals in Saturday’s U-20 South American Championship final round fixture. And at one point between his 23rd and 88th minute strikes, he pounced upon a loose ball and went hurtling towards the opposition goal. As he bolts past three defenders at the Estadio El Teniente in Chile, an excited commentator decides to illustrate the momentum in novel fashion. He makes the distinctive sound of an F1 car speeding round a track, which would have provided iconic accompaniment had the eventual shot gone in. Unfortunately it’s palmed away by the Brazilian goalkeeper – but it was still to be Hurtado’s day. The 18-year-old was part of the Venezuela squad that reached the final of the FIFA U-20 World Cup squad in 2017. They lost 1-0 to England on that occasion, with Everton’s Dominic Calvert-Lewin scoring the winner.